I have been busy cutting up, and baking pumpkins to make puree. I like trying different recipes this time of year when the pumpkins are bountiful. 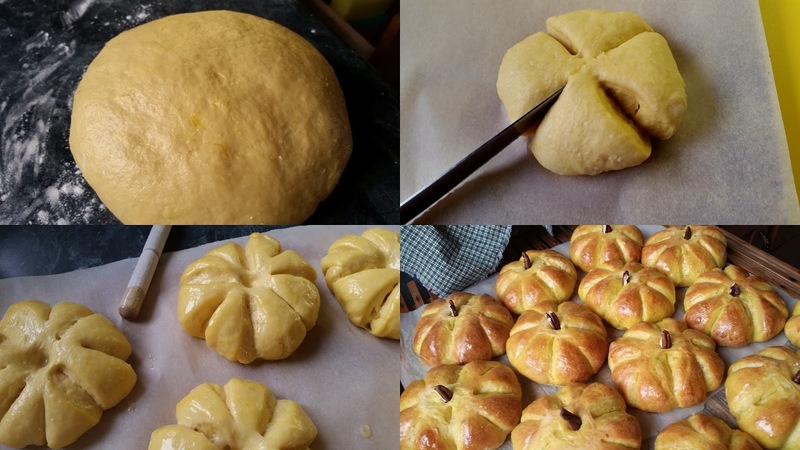 The idea of shaping these dinner rolls into pumpkin shapes came from pinterest. 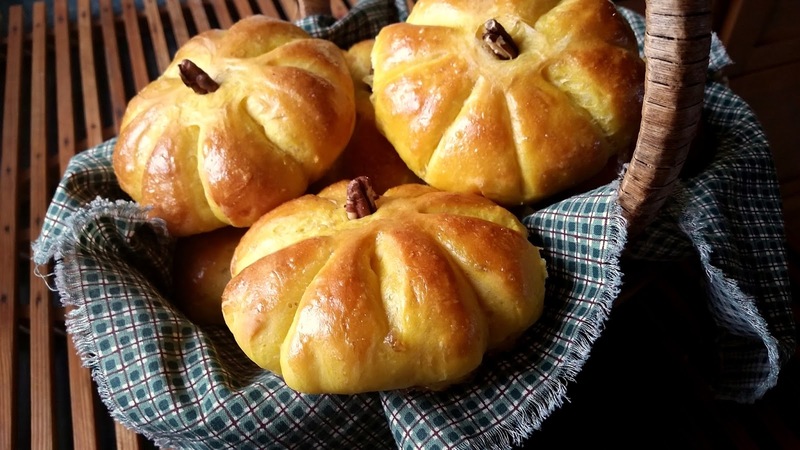 At first I was going to make pumpkin butter horn rolls but I think this is a better look for the season. So fun to eat as you pull the sections apart. They are delicious served with butter, jam, or honey butter. In a mixing bowl, whisk together milk, sugar, butter, pumpkin, and egg until blended. Stir in salt, yeast, and 4 cups of flour. Add the rest of the flour as needed and knead 5 minutes to make a smooth soft dough. It may be slightly sticky. Place in a greased bowl, cover and allow to rise for 1 hour in a warm place. Punch down dough and divide into 14 equal pieces. Roll each piece into a ball and place on a parchment lined pan, flatten each one slightly with your hand. Cut each ball into 8 slices, being careful not to slice all the way to the center. Cover and allow to rise until doubled in size, for 45 minutes. Using the end of a wooden spoon poke an indentation into each roll. Brush with egg wash.
Bake in a 375º oven for 15 minutes. Remove from oven and place a sliced pecan in each indentation. Awesome idea!!!!! This is a "keeper"!!!!!!! I'm trying these right now!! Am I reading this correctly? You bake your pumpkins in the oven to cook them? Unpeeled? Yes Linda I do. I wash the pumpkins, cut them in half and bake in a covered roaster at 400 degrees until tender. Scrape out the seeds and membranes. Scoop out the cooked pumpkin and mash. I like using pie pumpkins as they are smaller, have less moisture and have a beautiful orange color. Oh - how cute!!! I have to try this. I'm trying to make this recipe, and, it doesn't list how much flour. It says in the directions to add 4 cups of flour, then add the rest, as needed. How much is the 'rest as needed' amount???? Like I said, flour is not listed at all under ingredients. HELP!!!! I figured it out. Sorry, for some reason I kept skipping over the flour, to the egg mixture. I didn't find the flour info until the dough was rising. They turned out great. I'll make them again. Thanks. I'm happy you figured it out Cheryl and that they turned out great for you. We love them too! I finally tried these and they were quite tasty, not sweet or traditionally spicy pumpkin flavored, but a lovely color. I cut my dough with a scissors, and I should have pushed the slices closer together, as even with an additional rising they never came back together like you show, but remained a sort of truncated daisy. Yummy, though.